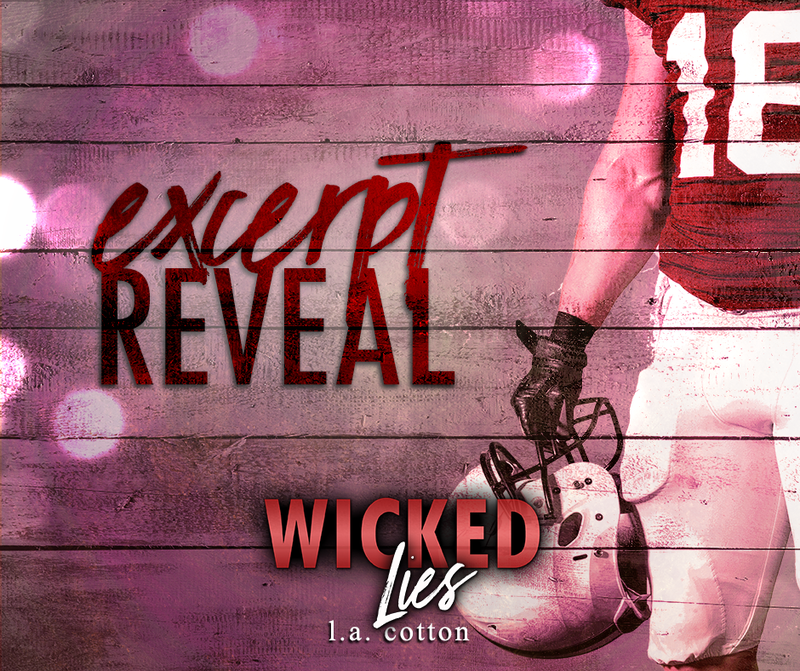 With only one week until the release of Wicked Lies (Wicked Bay #3) L A Cotton is sharing an excerpt with us! Check it out below and see how to win a $20 Amazon Gift Card! “I…” The words lodged in my throat. I wanted to go to college with Kyle. To be at his side. To be his everything. And there had been a time when I felt that I was. But he was hiding something. I’d suspected as much for a while now. Water sprayed around us and Lo and I shrieked as the guys, wet from the waves, howled with laughter. Kyle pulled me up and wrapped me into his arms, peppering my salty skin with warm wet kisses. “You know I love you, right?” His declaration seeped into my bones, washing away some of the lingering doubts. “I know. Now last one in buys ice cream.” Ripping out of his hold, I took off in a spray of sand and air. It didn’t take him long to catch up. His arms went around my waist and we stumbled into the ocean in a tangle of limbs. Eyes fixed right on me, Kyle stalked toward me through the water. When he reached me, he dipped down, snagging my hand and pulling me with him. My legs went around his waist as his arms steadied me and he moved us deeper until the water reached my shoulders. “Kyle, you’re freaking me out right now.” I quickly scanned the area around us. People were minding their own business. Groups of kids enjoying their summer break. The odd family chasing their toddlers in and out of the gentle waves. “I just need a minute.” He rolled his hips into me and I understood his words the second something hard connected with my stomach. “But I’m your pig.” He gave me no warning, slamming his mouth to mine. I gasped at first, overwhelmed by the intensity of his kiss, but as soon as his tongue traced the seam of my lips, my body relaxed. The familiarity of his touch soothed some part of me. Kyle’s fingers pressed into the flesh around my hips, searching, seeking, as our tongues swirled together. Our eyes locked, and I saw the secrets glittering in his eyes, a reminder of his betrayal. I didn’t doubt he loved me, I didn’t doubt his loyalty to me, but Kyle was keeping something from me. So why didn’t I push it? Why didn’t I demand answers? The truth? “I love you,” I rushed out, sealing my declaration with a kiss to his lips. Hungry and desperate, he kissed me back, his tongue licking and stroking every inch of my mouth. “Wahey, get some, Stone.” A chorus of cheers broke out around us and I buried my face in his shoulder. “At least one of us is, Berrick,” Kyle yelled back to his friends. Maverick’s basketball friends, to be precise. But Kyle fit in just as easily. Even though he was a year their junior, even though he was a Stone, not a Prince, they still loved him. That was half the problem. When we went off to college and he joined the Trojan’s football team, and the USC masses joined the Kyle Stone fan club, where did that leave little old me? At least people knew me here. I’d grown up with them. I wasn’t only Kyle Stone’s girlfriend, but if I followed him to USC, it was a label I wouldn’t be able to shake. Trey Berrick launched himself at Kyle and the two of them disappeared underneath the crystal blue water. With a resigned sigh, I walked the rest of the way back to the beach. Maybe it was a good thing I didn’t get time to reply because what would I have said? That I didn’t know? That I knew there was something coming between us? That as long as he had football there would always be something coming between us? I didn’t want to be that girl: insecure and jealous of her boyfriend’s future. But it was hard to love the very thing that would one day take the person you loved more than anything, away from you.